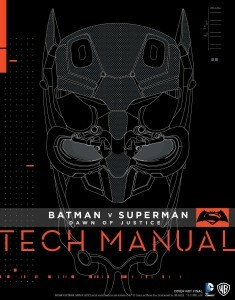 Win Batman v Superman: Dawn of Justice: Tech Manual! Batman v Superman: Dawn of Justice not only brought us the clash of two comic book titans, but also introduced us to a wealth of new characters in DC’s Extended Universe. To accompany the release, Titan Books have published Batman v Superman: Dawn of Justice: Tech Manual, a beautifully illustrated hardback book and a definitive guide to the weaponry and props created for the movie. It closely examines the Utility Belt, the Batwing, grappling hook and batarang. Everything in the Batcave is explored down to the construction of the set and the graphics from Bruce Wayne’s mainframe. This official volume also goes deeper in to the world of Batman v Superman: Dawn of Justice, showcasing Superman’s Kryptonian suit and Wonder Woman’s iconic weaponry. And to celebrate the book’s release we’ve got a copy of Batman v Superman: Dawn of Justice: Tech Manual to give away! Watch our Batman V Superman deleted scenes video for a chance to win and enter via the Gleam competition app below! The competition ends at 23:59 on 25 April 2016. The prize consists of an Batman v Superman: Dawn of Justice: Tech Manual book. Win Turn: Washington's Spies Season One Box Set starring Jamie Bell! 2 Comments for "Win Batman v Superman: Dawn of Justice: Tech Manual!" Lots of action in the new film, but always room for more! !